Yesterday’s article on Bearing Drift concerning Steve Waters has drawn considerable attention from folks across the Republican spectrum. For those unfamiliar with the story, let me give you a bit of background. In the past, Mr. Waters has associated with candidates and politicians that mainstream Republicans routinely dismiss and marginalize. For example, in 2008, Steve Waters ran Delegate Bob Marshall’s campaign for the Republican nomination for U.S. Senate, nearly upsetting establishment favourite and former Governor Jim Gilmore. Well, Bearing Drift informs us that the George Allen for Senate campaign has hired Waters. This development is drawing considerable attention for a number of reasons. Chief among them revolves around the extremely likely possibility that Delegate Marshall will be running against George Allen. If Marshall does throw his hat into the ring, Waters will not be in his corner. Now I know why the Allen campaign would hire Waters; having been involved with typically socially conservative activists, they hope to draw upon his knowledge and efforts to woo voters who I call the hard right. After all, in this primary, Allen’s major weakness is supposedly not being conservative enough. Steve Waters, they hope, will help counter this perception. Now when you ask why Waters would join Allen, the answer becomes murky. Perhaps Waters believes that Allen is a true conservative and is the best candidate. Maybe he has discovered that contrary to popular opinion Bob Marshall is not going to run or he has had a falling out with the Delegate and is going with his new first choice. Another likely possibility is that Waters thinks Allen will ultimately win and that he would like to be a part of the victory and the spoils it affords. After all, a spot on a Senate staff is a highly sought position. Reaction from this news is, not surprisingly, mixed. Allen supporters welcome the news and are touting Waters as a worthy ally in the fight ahead. Marshall people and those who oppose Allen are reacting with disbelief and anger, some comparing Waters to Benedict Arnold for selling out the “true” conservative movement. An opinion of Waters seems to be closely tied to one’s opinion of Allen. I’m not sure what to make of the whole situation really. I won’t say that I know Steve Waters too well. I did speak to him briefly during the 2008 Marshall campaign but cannot speak either positively or negatively of his efforts. I have heard some people give him praise for his hard work, after all Marshall nearly upset Gilmore. However, I’ve run across others who claim that Marshall almost won in spite of Waters supposed hindrance. Like 1,440 others, I claim Mr. Waters as a Facebook friend. Speaking of that matter, I do find it very bizarre that he must have gone through my friends list and sent friend requests to just about all of them, including ones that I know that he has never met and have little or nothing to do with Virginia politics. Getting back to an earlier point, the most interesting question of this whole affair is Waters’ motivation. Does he believe that George Allen is the best candidate? Is it a matter of money or power? Is he somehow seeking revenge against Marshall and his cadre of loyal supporters? Unfortunately, I expect this question to go unanswered. At the end of the day, I expect Steve Waters will draw some amount of conservatives toward Allen, but others will be unswayed. If the primary were held today, with or without Waters, the smart money is on Allen to win. Will Waters help Allen retain this edge through next year? Again, not knowing enough about Waters, I can’t answer that question. I’m just wondering how long it will be until the fuss dies down. Update: The Fifth District Watchdog makes an interesting point. Back in October of 2010, I got an invite to join the Facebook group “Republicans against a George Allen comeback“. Would you care to wager a guess who sent me the invite? This story is getting more odd by the minute. Given that revelation, Steve Waters joining the Allen team makes about as much sense as Ben Marchi joining Jamie Radtke’s crew. Although it is remotely possible that Waters has had a complete change of heart, these developments seem to smack of hypocrisy. Regardless of your feelings regarding Allen, it seems likely that Steve Waters has destroyed his political creditability with all parties. Great Falls, VA – Northern Virginia businessman and small government advocate, Tim Donner, announced today that he is entering the Virginia Republican primary as a candidate for the open U.S. Senate being vacated by Senator Jim Webb. Donner made his announcement on his website www.donnerforsenate.com. “I’ve watched this great country of ours sink deeply into the quicksand of overwhelming debt and dependency. And like many of you, I have grave concerns about our future,” Donner says. “The time for complaining about America’s problems is over. The time for solving them is now,” he concluded. Tim Donner will be available for phone interviews Tuesday morning, April 26 starting at 10:00 am and television interviews in Northern Virginia that afternoon. He will be touring the remainder of the state over the next few weeks and will available for in-person interviews at that time. Like so many of the other contenders, Mr. Donner will have to overcome the difficult hurdle that he is generally unknown in statewide politics. You’ll note that his comment against a “career politician” is an obvious dig against the two front frontrunners, George Allen and Tim Kaine. Digging deeper, his website promotes many conservative ideals, but the real test is, will he be able to distinguish himself in this expanding field? This latest entry begs the question, who else will make a play for the brass ring of our U.S. Senate Seat? Will there be any other surprise candidates? And how about Marshall or Stewart? Only time will tell. I wish Mr. Donner well and look forward to learning more about him and the rest of the hopefuls. Like many Virginians, I have not made up my mind for U.S. Senate. Whomever we select, I hope he or she will be a principled conservative who is never afraid to stand up for our values. After all, a good leader is not one who caves in to the slightest peer pressure, but one who remains strong. I want a Senator who has the courage to say what is sometimes the hardest word in the English language, no. And now for part two of our discussion on the Star Wars films. If you’ve missed the first one, I encourage you to check it out before delving into this segment. Much like A New Hope, The Empire Strikes Back is politically loaded. At the start of the film we are reintroduced to the overarching political struggle, as the Empire discovers the new Rebel Headquarters on the frozen tundra world of Hoth. After a short battle, the better-equipped Empire easily routs the Rebels despite their extensive defenses and entrenchments. In the remaining portion of the movie, we primarily follow the routed Rebels as they seek refuge and new allies in their struggle. Darth Vader takes his place as the central villain, not only in this film, but also in the entire Star Wars saga. Right off the bat, he reminds us of his evil ways with a taste of his power by killing several of his supposed allied Imperial officers. First, he strangles Admiral Ozzel after the Rebels on Hoth are needlessly alerted to the approaching Imperial fleet. Later, he repeats this deed on Captain Needa, the commander of one of the Star Destroyers, after Han and the rest of our rebel friends manage to escape the Imperial blockade. As further proof of his expanded influence, he either has (or assumes) the power to promote officers when he grants Captain Piett the rank of Admiral following Ozzel’s death. If you recall, in Episode IV, we see Darth Vader try a similar intimidation tactic aboard the first Death Star on Admiral Motti, but a superior officer, Tarkin, stops him. Although Darth never really acquires a traditional rank within the Empire, presumably his authority has grown given that there are no noticeable repercussions for his actions. Then again, perhaps, as Leia suggested in Episode IV, only an extremely powerful figure like Grand Moff Tarkin was capable of “holding Vader’s leash.” With Tarkin gone, and no other Grand Moff in the picture, Vader is free to terrorize his fellow servants of the Empire. Either way, for better or worse, the Emperor has let loose this mad dog upon the galaxy. This movie introduces two new characters of particular importance, Lando Calrissian and Yoda. Lando is an interesting figure as very early on he is revealed to be a traitor to his friend, Han Solo. Darth Vader holds Cloud City, a territory where Lando is more or less the mayor, hostage in exchange for Han’s (and Luke’s) capture. Lando has a difficult choice. Should he betray his friends to a ruthless murderer or should he gamble with the lives of the roughly five million inhabitants under his administration? Although one can certainly argue the morality of his decisions as well as his methods, he chooses the needs of the many and leads his guests into a trap. Immediately before his duplicity is revealed, Lando explains that his primary goal is to insure the freedom of his people from direct control of the Empire. Later, once Vader breaks and re-breaks the deal that he forced upon Lando, Calrissian openly defies his Imperial subjugation. Realizing that neither he nor the people of Cloud City will ever be free under a ruthless and deceptive monster like Vader, Lando order the evacuation of the city and personally joins the Rebellion. Although certainly reluctant at first, he ends up risking his political future, wealth, and even his own life for the sake of liberty. Then, once the Empire came into full power, rather than fight it directly or indirectly, Yoda cowardly sneaked into hiding on Dagobah, a planet so remote and devoid of any strategic value that no one would ever find him. He never went looking for Luke or anyone else. Clearly, he was guided by self-preservation and had little true loyalty to the supposedly selfless Jedi ideals of helping those in need. In fact, if not for the advice of Obi Wan, Yoda and Luke would have never met and thus he would have no hand in the destruction of the Empire. So how does he occupy his free time? Secretly hating the government and writing angry manifestos on his typewriter? The way he shuns technology and society fits the classic profile of violent neo-Luddites like Ted Kaczynski. Lastly, let’s examine the relationship between Darth Vader and Luke Skywalker. At the end of the climactic fight scene on Cloud City after Luke loses his hand, Vader reveals that he is Luke’s father. Following this shocking news, Vader informs Luke that the Emperor has prophesied his downfall at Luke’s hands. Vader then proposes an alliance between himself and Luke, a partnership of father and son to claim the Empire jointly under the guise of bringing order to the galaxy. The suggestion harkens back to the day of hereditary monarchies where mere blood relations were sufficient to legitimize the rulers of a nation. Why Darth would think that Luke would agree to partner with an estranged father who just seriously injured him merely for the sake of power and family ties may seem baffling, but clearly acquiring unquestioned power and the establishment of a dynasty are the primary driving motivations of Lord Vader. Perhaps even more surprising is Vader’s proposal to overthrow his leader and supposed master. Thus his loyalty lies only with himself and therefore swears fealty to no one. It is remarkable that the Emperor, with the aid of the force and his supposed political prowess, would not be able to detect such treachery but, as shown with Yoda, perhaps Jedi powers aren’t what they’re cracked up to be. But what about the shadowy leader of the Empire? Up through this point, we have only learned a bit about the character through his opponents and subordinates. I hope you stay tuned for part three of my commentary as we turn to him as well as additional political thoughts regarding this entertaining and timeless trilogy. One hundred and fifty years ago today, delegates from around the Virginia voted to withdraw the state from the United States of America. Now, unlike the states of the Deep South, Virginia did not leave the Union once Abraham Lincoln was elected President. Instead, it first sought a nonviolent solution to the disagreements plaguing the nation through the Peace Conference of 1861. However, the conference proved to be a failure, as it did not satisfy hardliners in either the North or the South. Although it might come as surprising news, the first time Virginia delegates met to consider the question of secession, on April 4th, 1861, the idea failed by a vote of 45 in favor with 90 opposed. Later events changed public opinion. With the capture of Fort Sumter on April 13th, Lincoln called for troops from each loyal state to crush the rebellion. According to D.C., Virginia’s commitment to the war effort was to be 2,340 men, but Governor Letcher refused to honor this request/demand. Taking in mind these new developments, by a vote of 88 to 55, state delegates adopted the ordinance of secession. On May 23rd of that same year, Virginia voters overwhelming approved the idea with 132,201 in favor and 37,451 against. Although Virginia did not choose to withdraw from the Union in late 1860 or early 1861, they clearly recognized the right of their southern brethren to do so. Only when asked to take up arms against the states of South Carolina, Mississippi, Florida, Alabama, Georgia, Louisiana, and Texas, did they finally reject the Union. Although we are free to argue about the motives of Virginians, perhaps they realized that a nation tyrannically held together through the force of arms destroyed the concepts of the Republic, the freedoms they cherished, and the original purpose of the war of independence from Great Britain. 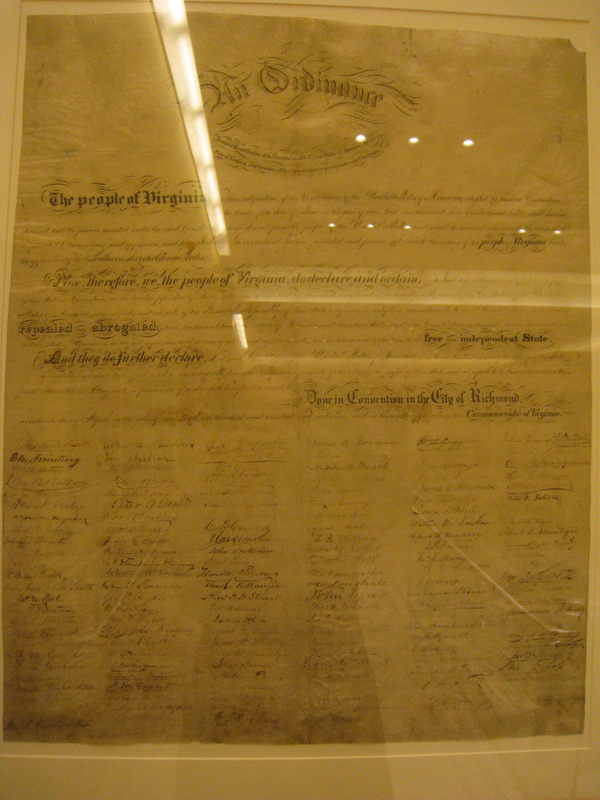 With the anniversary of this document, I believe it would serve all Virginians to reflect upon it. Not only should one pause to consider the causes of secession, but also the causes and terrible costs of the resulting war. The End of Chocolate Milk? Chocolate milk used to be in schools across the nation, but soon there may not be a drop to drink. A recent article in the Washington Post tells us that schools in both Washington D.C. and Fairfax County, Virginia have banned chocolate milk. Due to heightened fears over health concerns, some school administrators have called for an end to the beverage. However, as a result of public outcry, the Faixfax ban has already been rescinded. But is discontinuing chocolate milk in schools an appropriate action? I can recall drinking the beverage almost every day when I was in school, assuming the students from an earlier lunch period didn’t exhaust the supplies. Chocolate milk is popular. But why did I consume it? You see, I don’t really care for the taste of milk. However, if milk were mixed with something tasting better, like chocolate (or whatever chocolate-like substance goes into chocolate milk), I would consume it. We all know that milk provides many useful nutrients for growing children. The chocolate flavoring merely serves to make it more palatable. After all, how many other children, like I did, would choose some other drink if chocolate milk was not available? And if they rejected it, where would they get their source of calcium and vitamin D? On the other hand, one should be conscious of excessive sugar consumption, especially high fructose corn syrup, considering the rates of childhood obesity and diabetes are continuing to rise. Although I believe eliminating HFCS would improve the situation, if you would like to see more positive benefits to chocolate milk consumption, I have a suggestion. Even though I run the risk of sounding like a commercial for Nestlé, what about using Ovaltine? If some prepackaged product could be created using milk and Ovaltine, I think such a plan would be great for parents and children alike. After all, Ovaltine provides a whole host of vitamins and minerals beyond traditional milk. Best of all, combining Ovaltine with milk transforms the beverage into something tasty. Whenever I pour a glass of milk, I always add a generous amount of Ovaltine. Breakfast, lunch, or dinner; anytime is a great time for Ovaltine. I strongly believe that schools shouldn’t discontinue offering chocolate milk at lunchtime. After all, if I don’t drink regular milk, why should I expect current students to do so? Rather than the heavy hand of government regulation, couldn’t the business world come up with a suitable solution? Enough with the nanny state and the food police. Personally, I’d like to see Ovaltine come up with a premixed sort of chocolate milk. That way students can continue to enjoy the beverage and parents can appreciate the added nutritional benefits. Continuing our series on redistricting, I’d like to focus on the likely new boundaries for the lower house of the Virginia General Assembly, the House of Delegates. In today’s segment, we will be looking at my home past and present, the city of Harrisonburg and the surrounding county of Rockingham. As you can see, the 26th district (represented by Del. Tony Wilt of Broadway which is a town in Rockingham) encompasses the city and the northern half of the county. The rest is split between the 20th (represented by Del. Dickie Bell of Staunton city), the 25th (represented by Del. Steve Landes of Weyers Cave, a town in Augusta County), and the 15th (represented by Del. Todd Gilbert of Mt. Jackson, a town in Shenandoah County). Here’s a modest redistricting proposal. 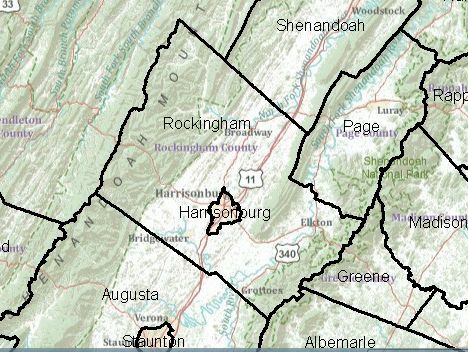 Because Harrisonburg has a greater population density than the surrounding county, both Harrisonburg and Rockingham County could be represented by two delegates assuming one collected the pieces from the 20th, 25th, and 15th. Although I believe that all four delegates have done a good job representing our shared Valley values, wouldn’t it make more sense to shave that number to two (or three depending on how the lines break)? Doesn’t it seem logical to have Rockingham County voters represented by, oh I don’t know, a citizen from Rockingham County? Instead we have only one Rockingham resident Delegate, as listed above, the rest are from Staunton, Augusta, and Shenandoah. Nevertheless, even if they aren’t all from Rockingham or Harrisonburg, at least they are all from the Shenandoah Valley. Disappointingly, this map still quarters Rockingham County between four seats. Like before, the 26th comprises the bulk while the remainder is divvied up between the 15th, the 25th, and a surprising newcomer, the 58th. As you might notice, the 25th takes an ugly jut through southwest Rockingham County as it swallows up territory formerly in the 20th. Traveling south and east we see that both the 20th and 25th districts are both heavily gerrymandered under this plan. 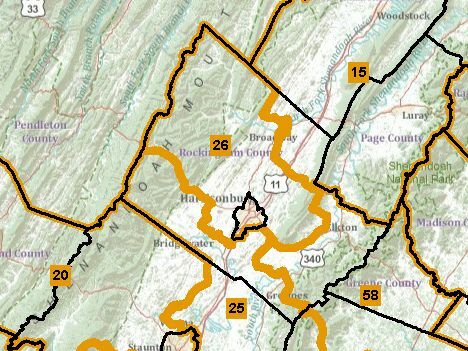 Regarding the 25th, does anyone else see a problem with a house district that goes from the West Virginia border to the outskirts of the city of Charlottesville around 50 miles away? Can you honestly tell me that the citizens of Rockingham have much in common with those living in the suburbs of Charlottesville? Having personally lived in both localities, I can assure you that they are as similar as night and day. And what of this 58th district? That seat is currently held by Delegate Rob Bell of Charlottesville. Again, I have no complaints against this Del. Bell, but if Rockingham residents can’t be represented by their neighbors shouldn’t they at least be represented by folks in the culturally connected Valley? Guess what citizens of Rockingham! 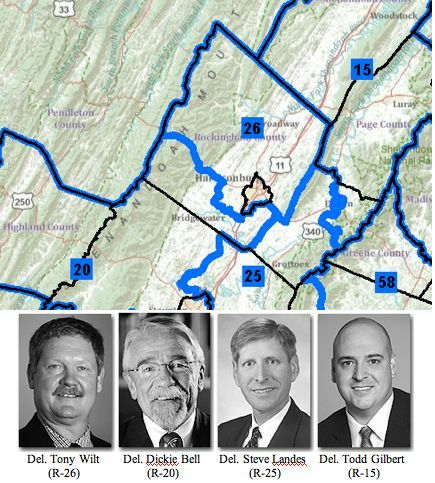 In order to visit the office of your new delegate, you’ll have to cross the Blue Ridge Mountains, travel through Greene County and then into Albemarle County. For some of you, that likely means a forty-five minute drive. Good luck with that. All of this discussion begs the question, why is Rockingham split as it is? Well, both Rockingham County and Augusta County to the south are some of the two most reliably Republican voting areas of the state. Think back to 2008 when Jim Gilmore was absolutely destroyed in the race for U.S. Senate. What were two of the measly six localities he won? Rockingham and Augusta. So why has Rockingham County swapped one Delegate Bell (Dickie) for another (Rob)? The answer may be seniority. After all, any Republican politician would love to have some rich conservative Rockingham soil in his or her district. Given that Del. Bell of Charlottesville has been in office for eight more years than Del. Bell of Staunton, I’m guessing padding his district is of greater importance to Del. Jones and whoever else had a hand in drawing this map. All the while, the voters of Rockingham are mere pawns in this political horse swap. If for no other reason than for the sake of my friends and family who are spread around Rockingham County, I hope this plan fails. Sure, it helps conservative Republicans, which is desirable for those who share my ideology, but it does so at the unacceptable expense of undermining our political process. Rockingham County is more than just a wheel of cheese to be sliced up as is politically convenient. Anyway, the take home point is this: For gerrymandering pure and simple this plan ought to be rejected by the General Assembly, the Governor, and the courts. Something is rotten in Rockingham. I can’t be the only person who notices this truth! Well, ladies and gentlemen, tax day is fast approaching. Hopefully you’ve gotten your taxes finished and filled and aren’t scrambling around gathering W-2s and various receipts. 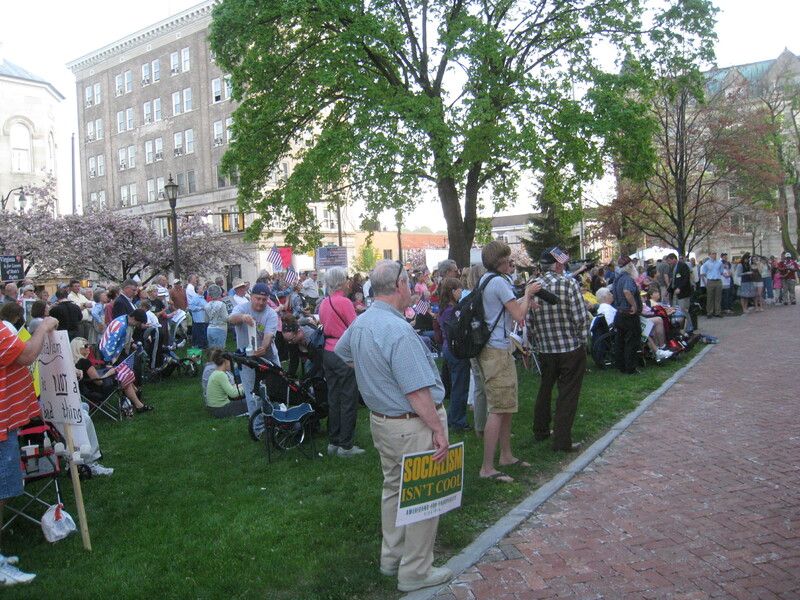 But putting such unpleasantness aside, April 15th means another Tea Party tax day rally is right around the corner. If you will recall, a mere three hundred and fifty days or so ago, hundreds of folks jammed into Harrisonburg’s Court Square to voice their support for fiscal responsibility and constitutional restraint. But if you thought last year was big, I’m pretty sure you haven’t seen anything yet. On Saturday April 16th, the Shenandoah Valley Tea Party will be hosting Tax Day 2011. This event promises to be exciting as it features former Governor and Senate hopeful George Allen, former Tea Party leader and Senate hopeful Jamie Radtke, Representative Bob Goodlatte (VA-6), State Senator Mark Obenshain (Harrisonburg-26), nationally known 2008 campaigner Tito “the builder” Munoz, and Joe Oddo with The Fair Tax. In addition, you can pick up shirts, bumper stickers, political playing cards, and assorted other Tea Party memorabilia. This event should be one you don’t want to miss. I’ll be in downtown Harrisonburg from the beginning to the end, 1 PM to 5PM. Join me on Saturday. You won’t regret it. A few moments ago, I received an email from the Radtke campaign. The bulk of it contains a letter from Jamie Radtke to Senator Harry Reid of Nevada (which was also recently posted on RedState). Although I get a lot of political email, I decided to share the letter here too given that it is well worth the read. As you will discover, it expresses a shared frustration regarding the seemingly endless spending coming out of D.C. coupled with a profound disappointment over the irrational understanding and demonization of the Tea Party movement by some politicians, pundits, and activists in the establishment. In the same way that an overwhelming majority of Americans did not want Obamacare, yet it was aggressively forced on them by the single-minded zealotry of the Democrats in Congress, you are again ignoring the will of the American people who, by majorities of 3-to-1, want you to cut spending. And you are so intent on getting your way and ignoring the demands of the electorate that you are forcing a government shutdown to prevent cutting a mere 1.5% of the budget. And rather than assuming responsibility for falling down on the job, failing to pass a budget last year and doing nothing to solve the fiscal mess you have put us in, you are again (just as with Obamacare) attacking the Tea Party for resisting you. Well, Senator, the Tea Party was right about Obamacare, and the Tea Party is right about cutting spending with the budget vote, and Americans know it. After adding $3.64 trillion to the national debt in just over two years, President Barack Obama and the Washington Democrats can claim credit for a $14.2 trillion debt, which equals nearly 100% of U.S. GDP! You must know that this level of debt-to-GDP is crushing our economy. The degree of cynicism and ideological zealotry required to ignore that threat for political purposes is breathtaking. So, given the cynical approach you and establishment Washington took on Obamacare and are taking on this budget issue, I can only say thank God for the Tea Party! The fact is, if there had been no Tea Party, the establishment career politicians (in both parties) would still be talking about whether we should steer a lot to the left or a little to the left as you drive our country off a cliff. Rest assured that, just as with Obamacare, the Tea Party will not be silenced, and we will not be satisfied until Washington puts an end to the fiscal insanity in Congress, saves the America we’ve always known and restores our liberty. Mark Twain once said, “Always do right. That will gratify some of the people, and astonish the rest.” The Tea Party seems to have astonished you with our resistance to Obamacare and Washington’s fiscal insanity. But you might as well get used to it, because Tea Party Americans will continue to stand with those doing the right thing until this mess is fixed. Last night, the Shenandoah Writers, along with several other local writing groups, hosted a “bad poetry” night in the lounge of the Clementine cafe in downtown Harrisonburg. Prior to the event, I had been mulling over the idea of what I should write. But then I thought, why not politics? After all, the oft-used expression is that one should write what one knows. Later that evening, a writing friend asked what would be my next post on this blog. To tell the truth, not many of my pieces are planned too far in advance. I’ve got a few articles that I wrote months ago that I’ll post sooner or later, but so much of what I write is just spur of the moment stuff. So then I got to thinking, why not share my poem from last night? It highlights how easy it is to become frustrated as a constitutional conservative given how fiscal irresponsibility has become commonplace. You’ll note that the poem is written in two differing colors. Unfortunately, WordPress will not allow me to leave an empty line between the breaks, therefore the color change indicates a new stanza. So is it “good” or “bad”? I’ll leave that decision to you. Why not prop up the despots? And give foreign aid to both sides? But who will pay for all these things? Give us more! Give it now! Starting at noon today, members of the Shenandoah Valley Tea Party stood outside Representative Bob Goodlatte’s Staunton office for an hour. Waving signs and chanting slogans, their purpose was threefold: to draw attention to the problem of massive federal spending, to encourage their elected representatives to vote against the continuing resolution for the budget, and for a return to some sort of fiscal sanity. Today’s event brings us to an important question; is the Tea Party upset with Representative Goodlatte? Although one of the members commented that the Representative was right on “99% of the issues”, she firmly stated that he can and should take a leading role to reduce the runaway debt and spending. After the rally (or protest depending on your definition of the word), the Tea Party presented the Representative’s office a document signed by around fifty of his constituents in support of their cause. With the deadline for the continuing budget resolution looming at the end of this week, we will soon discover what impact groups like the Tea Party will have on our elected officials. However, a few questions linger. Can the government maintain a balanced budget? Will we ever pay off our staggering federal debt? Do our Representatives and Senators have the sheer force of will to enact meaningful cuts in our bloated budget or will they continue the status quo? And, if there is no agreement, will the government suffer a shutdown of nonessential functions due to funding issues like what briefly happened back in 1995? If so, what impact, if any, will this potential decrease of services have on the lives of the average American?